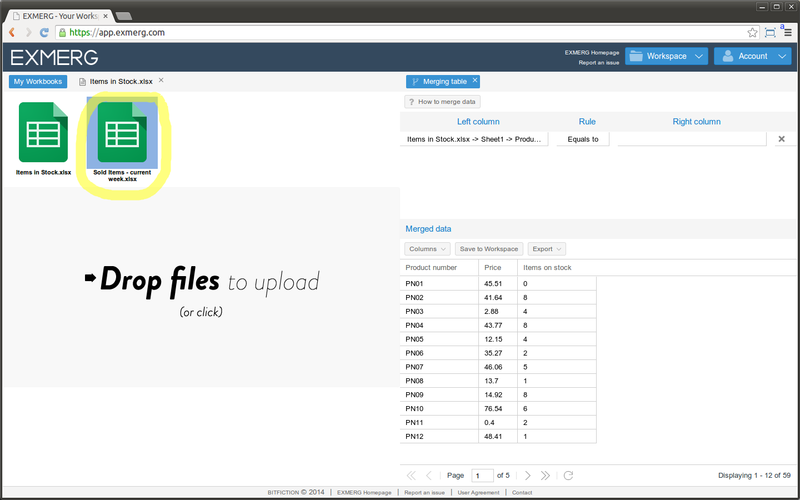 Merging data from multiple Microsoft Excel worksheets or CSV files is now problem of the past. 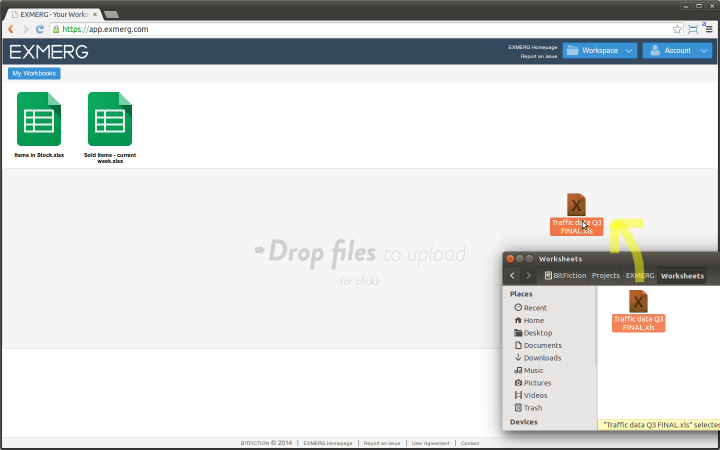 Use simple Drag&Drop instead of complicated macros and formulas. Merging data from various workbooks is one of the most frequent challenges spreadsheets users encounter. There are a few options how to merge data in MS Office Excel or one of it’s free alternatives. The problem is that these options (like VLOOKUP function) doesn’t scale automatically with your data. 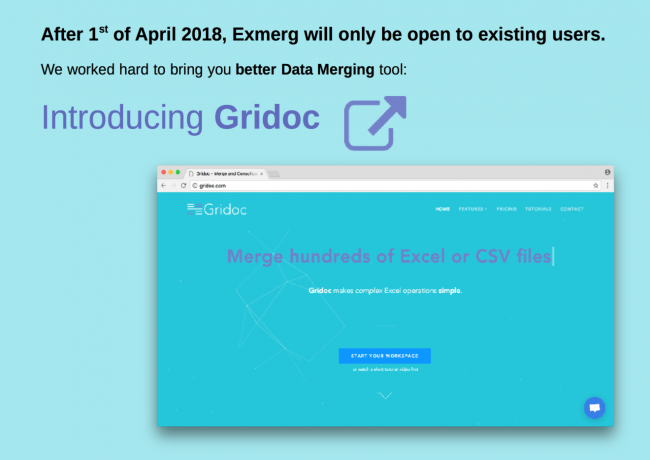 EXMERG provides Drag&Drop interface which enables you to focus on your data instead of figuring out how to merge them. Simply drag&drop the spreadsheet files into the upload area. Let’s go step by step to see how to merge data based on common columns. Following example uses sample files which can be added to workspace by clicking Workspace – Add Sample Files in app.exmerg.com. Click Merge Data in the Productivity Tools panel on the right – new Merge Data panel will open up. Now we are going to create matching rule. For the matching rule we need 2 columns – Left column and Right column. Drag header of the desired column into the Left column area. 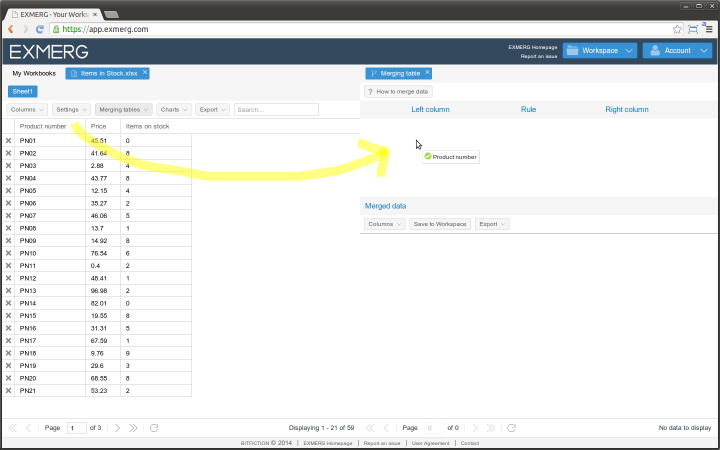 This will automatically load data from the original table into the merging table. Next, switch to the other workbook. Choose column which you want to match with the Left column, and drag header of that column into the Right column area. The matching rule is now complete and it is being applied to the data in the orginal worksheets. Use the “include only matching rows” rules to only include rows which contain matching values. 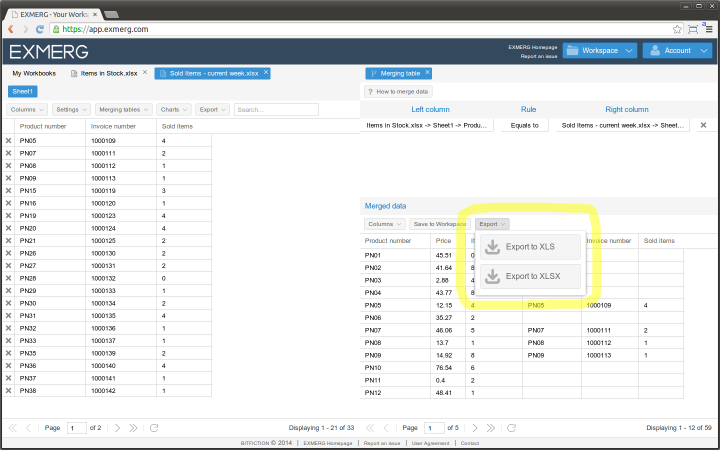 Merged data can be exported into CSV or XLS formats. You can use multiple matching rules at the same time. For example in the picture below, we created second matching rule for columns Items on stock and Sold items. 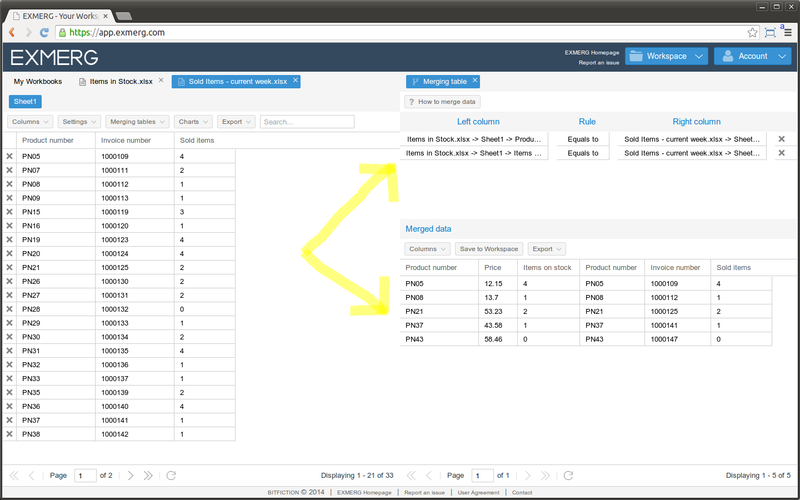 Only rows which are valid by both matching rules will be included in the merged data.